Football as a vehicle of soft power for Middle Eastern oil states is no longer a novelty. We’ve got used to Manchester City splashing the cash of the Sheikh Mansour. Manchester United’s official financial services partner is from Dubai, and a Saudi Arabian sovereign wealth fund is reportedly backing FIFA’s plans for an expanded Club World Cup. Qatar, meanwhile, has plastered its name across Barcelona’s shirt, funded the mind-boggling project at PSG and will host the next World Cup. Les Parisiens’ club president and Qatari government minister Nasser al-Khelaifi is even a member of UEFA’s Executive Committee. When we think of this phenomenon, our focus is usually on the very highest level of the world game, the few Western European super clubs regularly competing in the latter stages of the Champions League. If you have the money, it is the perfect place to maximise international impact. Yet while the glamour and bright lights of top-level competition might draw the attention, the financial influence of the Gulf States is also spreading outside the big European leagues. In Egypt this season, the emergence of the Saudi-backed Pyramids FC has transformed the football landscape, bringing money, players, conflict and controversy. It’s quite a story. It all started in December 2017 when Saudi Arabian billionaire and then-chairman of the country’s General Sports Authority Turki Al-Sheikh was appointed honorary president of Egyptian giants Al Ahly. 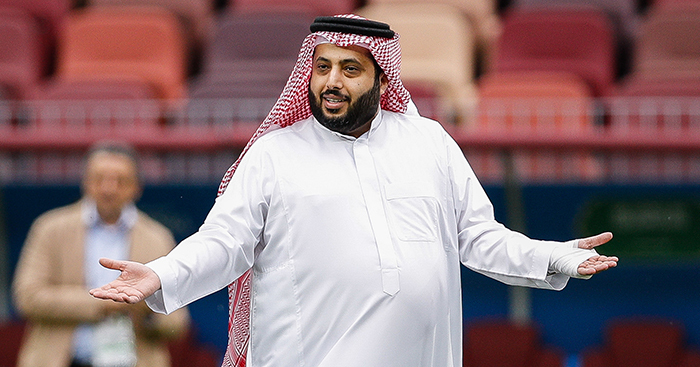 The club was in a financial predicament and needed the resources of al-Sheikh, who claimed to be a long-time fan. A project for a new stadium was presented and there was talk of big-name signings, but the relationship between the eccentric Al-Sheikh and Al Ahly soon started to sour. A series of minor disagreements over transfers culminated in Argentine manager Ramón Diaz, who had been heavily linked to Al Ahly, choosing to take over at Saudi side Al-Ittihad instead. The finger of blame was pointed at Saudi Sports Minister Al-Sheikh, and days later he announced his resignation from the club. But in a country where football is a powerful political tool, Al-Sheikh did not want to lose the influence he had gained. Within a few weeks he was back with a plan to take revenge on the club from which he had been ousted. The owner of Al Assiouty, a mid-table Egyptian Premier League side, announced in June 2018 that his club would be sold to Al-Sheikh. And Al Assiouty would move from Beni Suef to Cairo and change its name to the more attention-grabbing, if a little clichéd, Pyramids FC. Signings soon started flooding in. Ali Gabr and Ahmed Tawfik were snatched from Al Ahly’s traditional rivals Zamalek and sights were set on Brazil’s Série A to add some South American swagger to the newly-established side. Skilful Palmieras wide-man Keno was the first to arrive, costing an African-record US$10m, and was swiftly followed by Carlos Eduardo, Lucas Ribamar, Arthur Caíke and Rodriguinho. To oversee the project, Al-Sheikh turned to Alberto Valentim, another Brazilian who was making a name for himself as manager of Rio de Janeiro club Botafogo. The honeymoon period did not last long. Al-Sheikh took an almost immediate dislike to Ribamar and, just two games into the season, ordered Valentim to leave him out of the team. But Valentim was unfazed and in the following game sent Ribamar out to lead the attack. Deliciously, he scored twice in a 2-1 win, but Al-Sheikh is a man not used to being disobeyed. Valentim was sacked and Ribamar sent out on loan to Saudi League club Ohod. As the head of Saudi sport, a position of which he has since been relieved, Al-Sheikh could effectively decide who came and went from any of the clubs in his homeland. Since the Ribamar/Valentim incident, things have only grown more bizarre. The Saudi businessman has twice publicly threatened to sell the club, and the turnover of players and managers has kept up the same breathless pace. Since Valentim’s departure, two further coaches, Ricardo La Volpe and Hossam Hassan, have been shown the door. Al-Sheikh also started a television channel that shows Spanish and English football in addition to Pyramids games. To host, ex-Tottenham striker Mido was signed up, and a number of illustrious pundits have appeared, including Ronaldinho Gaúcho, John Terry, Roberto Carlos and Robbie Keane. Never before has something happened in Egypt. Pyramids have certainly shaken things up, injecting some much-needed cash into the country’s football economy and competition into the league. Even the long-standing stadium ban, which had been in place at all league games since the Port Said stadium riot left 74 dead in 2012, was lifted. But not all would agree. A war of words between Pyramids and Al Ahly has developed over scheduling, which Al-Sheikh felt were being manipulated to favour their more traditional rivals. Zamalek and Al Ahly, currently first and second in the Egyptian Premier League having both played two games fewer than third-placed Pyramids, are yet to face each other this season owing to commitments in regional and continental competitions. This has riled Pyramids, who in February threatened to complain to FIFA. A recent game between Al Ahly and Pyramids was postponed as a result of the dispute and there have been calls from some quarters to cancel the league entirely, as it will likely not be finished in time for the Africa Cup of Nations, which Egypt hosts in June. Officiating has been another predictable point of contention, and foreign referees, including Danilo Grujic, the man who oversaw the 2018 Champions League final, have been drafted in at Pyramid’s request (and expense) to officiate in three of their matches. This weekend, Al Ahly finally take on Zamalek in one the world’s great derbies and a draw or Al Ahly win leave Pyramids six points off top spot with six rounds to play. Although Al-Sheikh has openly said it will take “from three to five years” to put themselves in a position to win titles, with games against Al Ahly and Zamalek to come, the squad might harbour hope of doing so at the first time of asking. And the man set to lead them in their search? Ramón Diaz, the very same Argentine manager who sparked this saga when he decided not to go to Al Ahly, and who has now been tempted to Cairo by the millions at Pyramids’ disposal. With Al-Sheikh’s volatility, it is difficult to say where or when the Pyramids experiment will end, but the effect he is having on Egyptian football is undeniable. And as the wealthy and powerful realise the influence they can wield using football as a tool outside the traditional centre of Western Europe, it will not be a surprise if we see similar stories unfold elsewhere.